With a name like Rise Casino, you’d hope this online casino site would make a big first impression, and landing on the market in 2018, it’s going to have to if it has any chance of surviving in the incredibly competitive online casino market. Operated by Cassava Enterprises, the Dragonfish software arm of 888 Holdings that also operates sites such as 888 Casino, Casino 848, Casino On Net, Reef Club Casino, Tasty Bingo, and Vegas Spins, Rise Casino certainly has a decent amount of clout behind it. 888 is one of the most recognisable names in the gambling industry, and despite a difficult 2017 that saw them being hit by a record breaking fine by the UKGC, that name still carries a strong reputation on the iGaming world. This all definitely works to the favour of Rise Casino, having a reputation before you even arrive is a sure-fire way to make the right impression, but there’s also a lot of work for the site itself to do. The name behind the brand only catches the attention of players, keeping that attention is much harder and takes a combination of style and content that surprisingly few online casinos get right, considering the huge number that have tried. Can Rise Casino add its name to that exclusive list of online casino sites destined for the top of the pile? In a word, no. Not if the design work at this site is anything to go by at least, because the artwork and colour schemes would have felt outdated in a 90s bingo hall. Blue and yellow are the main colours here, and the unpleasantly bright shade of both that is used makes it genuinely difficult to focus on anything that’s happening on the screen. To this end, the bold, block lettering in all the marketing on the site, whether it be for games or promotions, is helpful in its way. However, that doesn’t change the fact it looks horrible. The whole site just feels thrown together using the first colours and fonts that were found, and even though attention to detail has clearly gone into the navigational tools that make finding the right game easy, including the standard thumbnails on the homepage, it cannot make up for the many shortcomings this site has. In order to look like a casino with any chance of challenging for superiority in the current iGaming climate, Rise Casino needs a serious rethink in terms of theme and design. It would take a huge array of games to make up for the lacklustre design work here, and Rise Casino doesn’t have enough to cut it. Over 300 games is a good start, especially when they come from a group of software developers that includes 888 Holdings, Bally Wulff, Eyecon, IGT, NetEnt, NextGen Gaming, PariPlay, SG Digital, SG Gaming, Thunderkick, and Williams Interactive, but all you need to do is compare that with the myriad of other online casino sites that are available to know that Rise Casino cannot stand up against them. 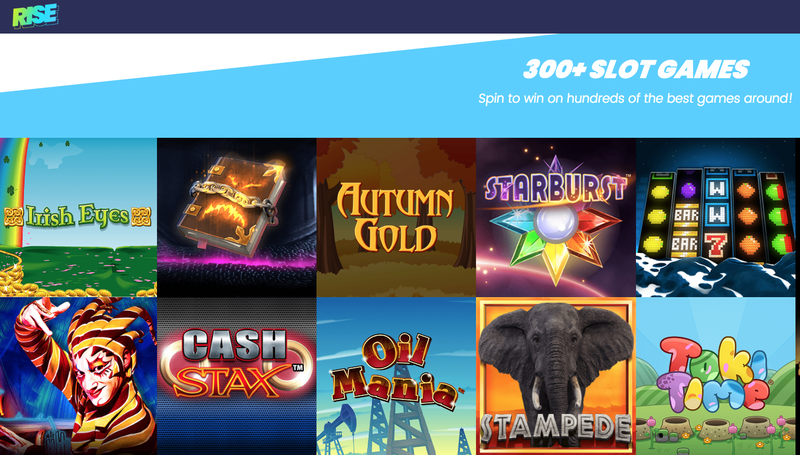 The selection of slot games available is the most abundant here, and Rise are not shy of putting these games front and centre on the homepage, but there’s nothing here we haven’t seen before. Either several high-profile names, or a few lesser-known up and comers (preferably a combination of the two) will be necessary if Rise Casino has any chance of being a genuine contender in the iGaming world. It should also be pointed out that even if Rise Casino develops the best games portfolio in the world, it’ll probably still need a revamp in terms of design!